The theatrical event, hosted in partnership with Rise Up and Vote, was a play on the power of conversation. Like many within the fashion industry today, Chloe Gosselin is keen to use her platform to inspire change. So though the primary purpose of her New York Fashion Week presentation was to show the Spring/Summer 2019 collection to press and buyers, she also used the opportunity to encourage young women to vote in the midterm elections. Gosselin had a fitting partner in Rise Up and Vote. Some of the models wore T-shirts bearing the words “I am a Voter”, while the soundtrack featured speeches by Hillary Clinton, Malala Yousafzai and Chimamanda Ngozi Adichie. 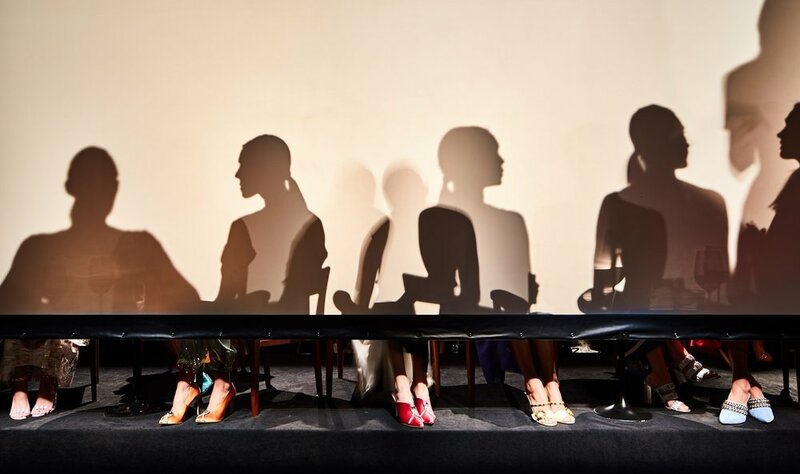 The theatrical event featured a diverse cast of models — including transgender model Lenya Bloom — who were seen only in silhouette, seated at tables behind a screen, with just their legs and shoes exposed to guests. Occasionally they would step out from behind the screen in small groups, to enhance the conversational theme. 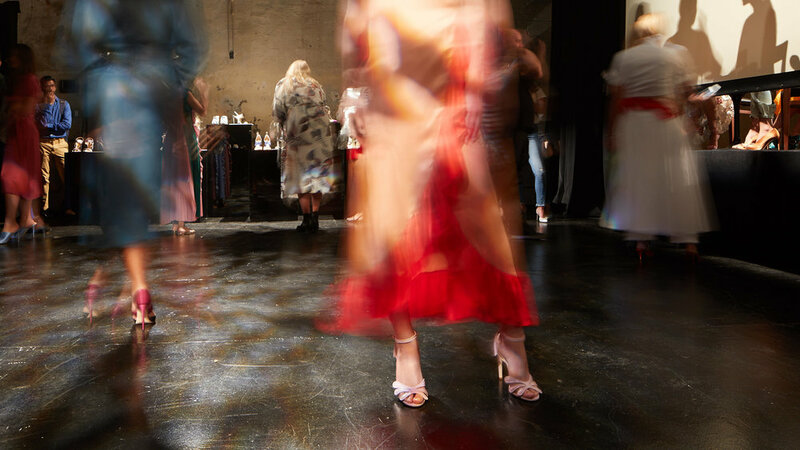 As with previous collections, Spring/Summer 2019 references vintage fashion and the way women wear color in their everyday lives. In a play on contrasting textures, flat russet mules are elevated by a chunky gold chain, while high vamp teal satin pumps come embellished with a vintage-inspired crystal brooch. Delicate gold link hardware offers a new take on Gosselin’s signature crescent moon motif, while Fall’s surrealist hand-drawn print has been reimagined in forest green and white silk. 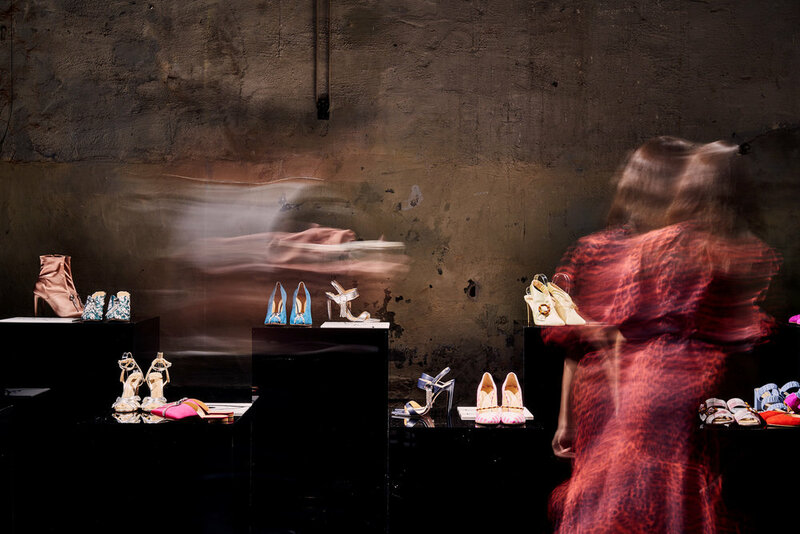 The presentation was attended by guests including influencer Samantha Angelo and singer Tori Amos — the inspiration for Fall’s Tori sandal.